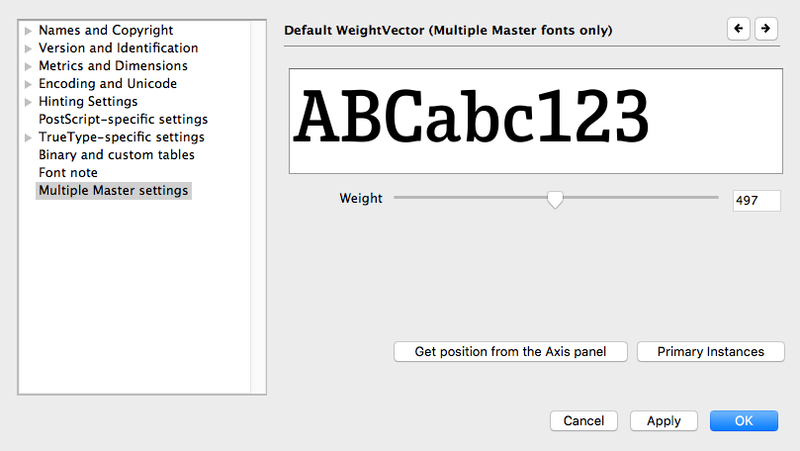 I have a question about kerning in multiple master fonts in FontLab. Lets say you have two separate .vfb fonts representing the extremes of weight. Now lets say you've kerned both individually and then made a multiple master font via 'blend'. The new font contains no features or kerning, but if you open a metrics window it seems like some kerning pairs have been retained (while some others have not). Does anyone know how kerning is dealt with in multiple master fonts? where are the kerning tables stored? is kerning interpolated as well? The font editor should interpolate the kerning. I've never used "Blend". I use the old "Mask-to-Master" techinque and never have any issues with kerning. Thanks for your responses, I see that I've been wasting time messing with blends! I was not clear on how exactly to use the whole mask-to-master concept, thanks for the clear explanation. I would add that when you use the mask-to-master approach, make sure you check "Do not add points". This will require you to be rigorous in your outline drawing and point placement, but will eliminate any "surprises". Also once you have the axis set up use the Multiple Master setting in the preferences to change the display in the font window to something between the original axes. THis way any incompatible outlines will be visible in the font window. Thanks James Montalbano, in fact that was a trick I had been using with the blends as well, good to hear its still a valid approach.